Frances answer to the porsche 911 was the alpine v6. Although it did not make its appearance until 1971 (five years after the porsche 911s debut), the alpine v6 had many similarities in its character and in the way it has evolved over the years. Top speed of 152 mph engine typedrivetrain: Light-alloy v6 with one overhead camshaft per bank of cylinders displacement 2,458 cc (2.46 l) power rating 185 hp transmission 4 or 5-speed manual chassis: Steel backbone; Independent front suspension by coil, wishbone, rubber elements and antiroll bar; Rear suspension by coil spring and wishbone with antiroll bar; 2,662 lbs. The french 911 like its german counterpart, the alpines engine was mounted behind the rear axle. The purpose of positioning the engine so far to the rear was to leave the maximum possible passenger space, and the alpines claim to be a genuine 2+2 could not be denied. 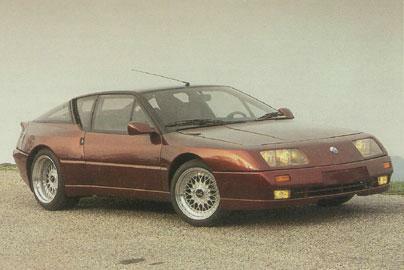 Another advantage to this configuration was that it made the alpine one of the quietest grand tourers around. In its construction, the alpine evoked lotus rather than porsche, with a steel backbone chassis and plastic bodywork. blown v6 since 1976, the alpine has been fitted with the light alloy v6 power unit jointly developed by peugeot-renault-volvo. After initial troubles, the engine was refined and electronic fuel injection specified. In 1985, the bodywork was designed as an evolution of the earlier model, again paralleling the 911- the addition of the turbocharger has made the alpine one of europes fastest road cars. The le mans alpine v6, launched in may 1989, is the latest version of this turbocharged gt.